We are a premier skilled nursing facility located in Visalia, CA. Westgate Gardens Care Center provides compassionate and personal skilled care 24 hours a day. We specialize in providing rehabilitation services on site to help our residents regain their independence and return to their homes. Our team of qualified professionals helps residents recover from surgery, injury or serious illness. We understand the importance of creating a comfortable and nurturing atmosphere, whether residents stay for short-term treatment or long-term care. Westgate Gardens Care Center sits in an ideal location. Our residents enjoy our large hotel lobby feel, wide hallways, and exceptionally large rooms. We are pleased to offer 12 private suites, with each room featuring its own private restroom. We know that the transition to a skilled nursing facility is challenging which is why we strive to ease the process by providing special accommodations in a comfortable environment where our residents and guests can feel at home. At Westgate Gardens Care Center not only do we offer beautiful accommodations, but our quality of care is what sets us apart. We employ friendly and highly skilled individuals so that our residents can meet their maximum potential. We specialize in wound care offering a certified wound Doctor and RN consultant. In addition to nurses and staff who are always available to answer questions and lend a hand, each resident is paired with a coordinator, to help ease transition and provide a familiar smiling face. From sunny resident rooms to tranquil common areas and lounges, and tasty dining services – we strive to make Westgate Gardens Care Center relaxed and enjoyable. Visitors are welcome every day of the week. Come see our residents and friendly staff in action. 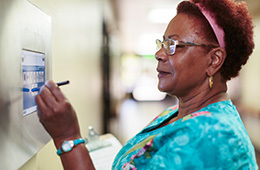 Please contact us to learn more about the unique, sophisticated healthcare environment at Westgate Gardens Care Center. All 140 beds are Medicare and Medicaid certified.